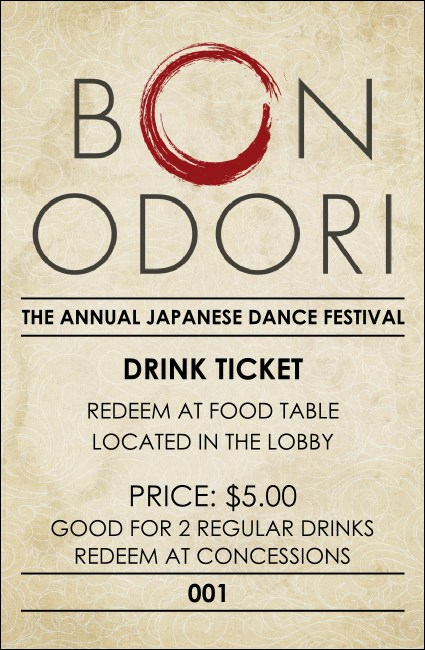 Bestow complimentary drinks to performers and other special attendees at Obon with a stack of Bon Odori Drink Tickets. Representing the Bon Odori dance’s traditional, circular shape, a single red brushstroke punctuates this template’s headline. Tailor its seven text lines to your celebration in minutes. Begin by navigating to the customize tab above! Offer guests a drink on the house with TicketPrinting.com!